Desigual fashion shows are always a lot of fun to attend — and seems like a lot of fun for the models too, as there were tons of smiles on the flirty models walking down the runway. In true Desigual fashion, of course there were also tons of prints and vibrant colors. Boring is definitely one thing that this fashion show is not. Read on to see the entire line-up from the show. 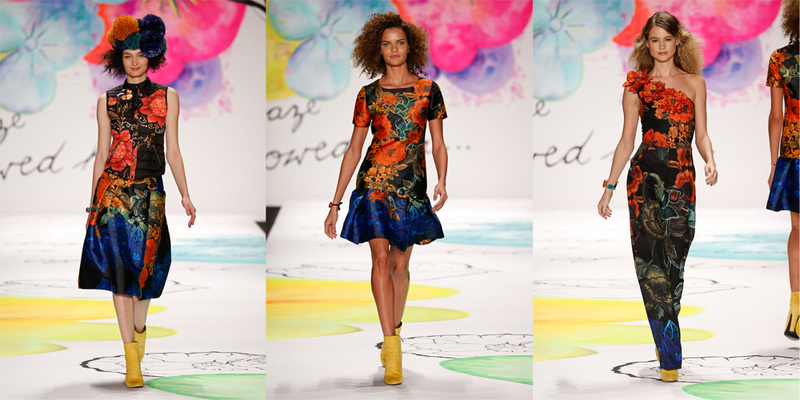 All images courtesy of Desigual. Hello there, gorgeous + vibrant prints! What a killer show! I can only dream of attending this.. such a cool experience! Loved, loved, loved this show! Such fun, colorful and happy looks!